RSVP Deadline is Tomorrow, April 17! 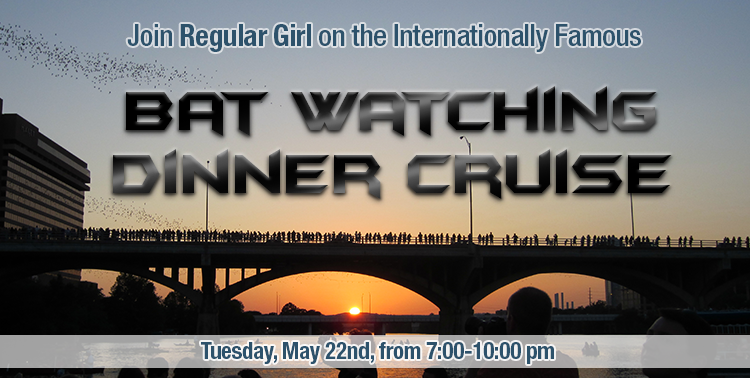 On Tuesday night, May 22, join Dr. Felicia Stoler and our friends at Regular Girl as they host a bat watching dinner cruise along Austin’s beautiful Lady Bird Lake. This cruise provides the best possible viewing for one of the most incredible wildlife spectacles in the world! This complimentary event is by invitation-only. There are a limited number of spaces available and will be filled on a first come, first served basis. Please RSVP by 4/17. that promises to be a truly unique experience! Dr. Felicia Stoler – America’s Health & Wellness Expert™ – is a registered dietitian nutritionist, exercise physiologist and expert consultant in disease prevention, wellness and healthful living. She has a bachelors from Tulane University, a masters in applied physiology and nutrition from Columbia University and doctorate in clinical nutrition from Rutgers University.